Really depends on the group size, but I’d allow at least 2 hours for a group of 10 to play three rounds. 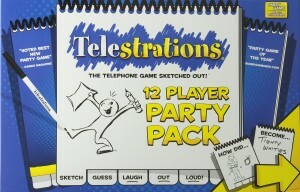 There are two versions of this game, an eight player version and a 12 player party-pack version for larger groups. It’s available online (Amazon, etc), or from most decent shops which sell board games. This is a fantastic board game on its own. Great for families, or groups of friends. In a nutshell, it combines Pictionary (drawing, with no letters, numbers or symbols) and Broken Telephone (a game where a word or phrase is whispered from person to person, almost always returning to the originator with a completely different word or phrase). It can be played with any number of people (up to 8 if you have the 8-player version, or up to 12 if you have the party pack; I’ve found you need at least five people for it to get good). Each person playing is given a whiteboard book. They write a word on the first page, and pass their book to the person beside them. Then, they attempt to draw whatever the person has written. Once 30 seconds are up, the books are passed again. They then have to guess whatever has been drawn, without looking at the original word. This repeats until each person has the book they started with. Each person then starts with their initial word, and watches the progress from whatever they started with morph into something entirely different. Sometimes, a word will make it all the way around successfully. And while that’s good, it’s not usually as much fun! The game itself comes with cards, and the idea is to use the cards to determine what the word will be for each round. However, I’ve found this to be a great game, with lots of laughs, to get to know others on the team. I’ve started by asking team members to draw something that interests them. For the first round, this introduces people to the flow of the game, and generates some nice conversations about the interests of those on our team. Depending on your objective, you can customize the following questions to suit your needs. In a recent example of running this game, my next question to my large team was to write something that they bring to the team. Many wrote things along the lines of collaboration/teamwork, a specific programming language, or a domain expertise. What’s very interesting is to discuss, at the end of the game or round, what happened when people weren’t sure what the person had drawn… Teamwork is a pretty difficult concept to draw in 30 seconds, especially if you’re not a great artist! What I’ve seen happen is that people apply their own biases to whatever’s been drawn. The power of this game is that it’s fun, and it levels the playing field as often no one on the team is an exceptionally strong artist, making the review at the end of each round very entertaining, and brings down barriers people often have when working with those they don’t know very well (or at all). For the third and final round in a recent use of this game with a team, I asked them to draw what they hoped to personally get out being a part of the team. However, I’d highly recommend customizing the questions to suit your own setting. At the end of three rounds (or more or less depending on your group size and time constraints), you’re able to conduct a review of what people observed. It’s likely that it’ll take a bit of prompting to help people recall what was drawn, since everyone is just having a lot of fun… However, you can guide the conversation to common themes, phrases, or ideas that people came up with. In the recent example I mentioned above, we had a lot of people talking about collaborating, working with others, learning from others as the things they are bringing to the team. What was equally interesting is that many of these were repeated in what people wanted to get out of working with this team. There were also some specific technologies and domains that came out. But what was interesting is that even when someone started with something like AngularJS as something they wanted to learn as a part of the team, by the time it made it around the group, it had evolved to Pair/Team Programming. Very interesting discussion about how our own biases can taint what others have done; but based on my experience, there’s a lot more that connects us that makes us different. This makes a great launchpad into a discussion about team norms, team goals, shared vision, etc. Most of all, lots of fun and lots of laughs.